Thanks to information from a family member, we know that Mary Gage was born in 1898 to Charles Hershal Gage and his first wife Samantha Daily, in Decatur, Adams County, Indiana. Samantha was an artist who died not long after Mary was born. Samantha's family took care of Mary after the death of her mother. Mary's father was a teacher educated at Valparaiso College, and was able to get a job teaching about 20 miles from Decatur. He felt it would be in his daughter's best interest to be taken care of by a "mother" figure, a common practice at the time, and traveled every weekend to stay with her and his in-laws. Later Charles married Gertrude Kitson. They moved to Mott, North Dakota following their marriage to homestead several thousand acres there. Mary was approximately nine years old at the time her father moved. She had no interest in going to the Dakotas and asked to stay behind. A sister Erma was born to Charles and Gertrude in North Dakota in 1907. When Erma was 6 or 7 the family moved back to Adams County, Indiana. Mary was very eccentric and by her own choosing was somewhat estranged from the family. In the 40s or 50s "she was a hippy before there was such a thing." She drove a woody station wagon, wore a bandanna, and usually had 13-14 standard sized poodles with her. She rented out her house, and lived in a barn behind it. A relative once saw her shaving a poodle on the table and then sitting down to eat at the table without cleaning off any of the dog hair. Most people who knew her mentioned that she had a distinct "fragrance of dog." links fashioned from heavy twisted silver wire. 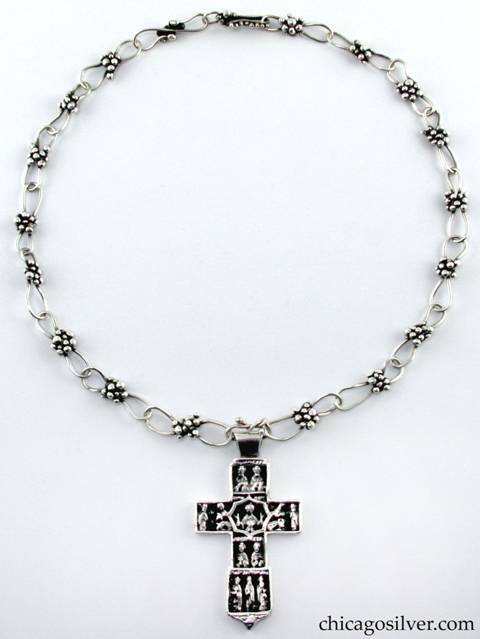 Cross: 3-1/2" H and 1-7/8" W.
Another relative once visited her and reported that Mary was so mad at the gas company that she had no heat and was sitting huddled in an electric blanket. She was also mad at the Post Office, and had a large collection of mail that she would not open. Mary did keep tabs on her family -- she knew Erma's husband had died, and had Erma's picture on her desk. "Mary G. Gage died March 13  in Portland , Maine on the eve of the 'Great Blizzard.' She was born August 16, 1898 in St.Mary's (Township) Indiana. "During her life, she had been a medical technician, a silversmith, a breeder of French poodles, a used-book seller, and an antique's dealer. After serving as a nurse at the time of World War I, she moved to Chicago where she studied and worked at St. Luke's hospital. In the early 20's she fled a brief marriage and spent three years traveling around the world; two of those years were spent in China, including a year in Peking. She developed then a life-long interest in things Chinese, ranging from literature to design to erotica to food. The balance of her trip was spent in India, Africa (including a trip on the Blue Train to Lake Victoria), and Argentina. 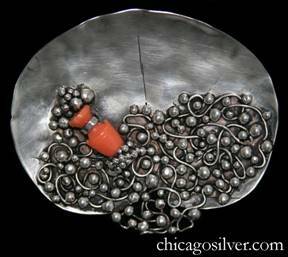 "On return to the States, she learned silversmithing and set up in business in New York. She owned a row house in Greenwich Village and had a workshop in SoHo where she was a regular at Fanelli's Bar. Her jewelry was sold in uptown shops and at exhibits throughout the country. "In the 1940's, she lived in an old mill on the river in Westport, Connecticut, raising poodles. Following that, she moved to Hartland, Vermont, where she salvaged an elegant old brick house, which, after she left, became the Hartland Antique Center. "In the '50's, Mary Gage moved to Maine, spending a number of years in Waldoboro, working as a silversmith, antiques and used-book dealer, and poodle breeder. At some point she also had a cat that did well in commercials. The citizens of Waldoboro didn't much appreciate Mary Gage (She was different, and her place did reek of dogs). In turn, she loathed Waldoboro, which she referred to as 'that pusspocket.' Her last years were spent in a Portland apartment where she continued to make jewelry and occasionally bought and sold antiques. "Throughout her life, she had a series of interesting friends and acquaintances: from Henry Ford when she was a girl in school, to gum magnate Phillip Wrigley, whom she met in India, to Isamu Noguchi in New York to James Thurber in Connecticut, Maxfield Parrish in Vermont. 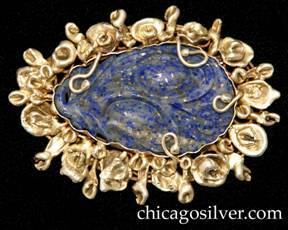 "In recent years, her jewelry has enjoyed increased interest as The Arts and Crafts movement has come to the fore. Auction houses have begun to feature her pieces and collectors have actively been seeking her work." In her book Jewelry & Metalwork in the Arts & Crafts Tradition (p. 238), Elyse Zorn Karlin wrote that Gage had no formal training, and "learned her craft by working with Armenian and Yemenite Jews in Greenwich Village. In 1924 she had a workshop in Greenwich Village and later one in Soho." 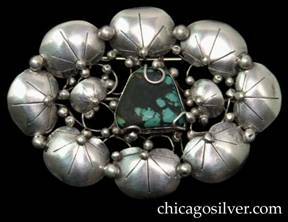 Her work is very identifiable, with complex wirework frames, applied lily pads or leaves and silver balls, and extensive use of turquoise and other semiprecious stones. Her work is often confused with that of a contemporary with whom she was well acquainted, Lillian Pines. Brooch / pin, and matching ring. 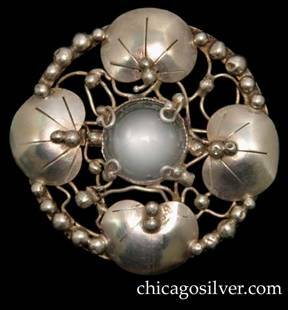 Brooch is round, with four chased lily pads centering a round moonstone or rock crystal on a round frame with beads around the edge and on irregular patterns of vines between the lily pads. 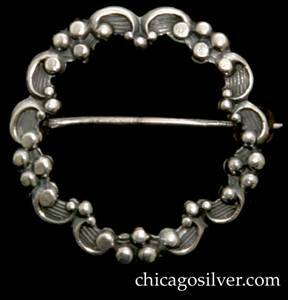 Stone is also secured by four silver loops ending with small beads. 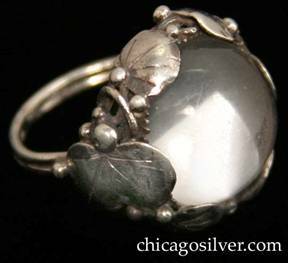 Ring has large round moonstone or rock crystal surrounded by small chased lily pads and beads at base. Ring, with freeform bezel-set turquoise stone surrounded by silver beads and curving wires. On each side is an applied leaf with silver beads. Brooch / pin, very large, inverted heart-shape with extensive bead and wirework ornament covering the entire lower half and spilling over into the empty space between the two lobes of the "heart." In the center, on the left, is a carved orange stone jug set at an angle, attached with a bare metal loop around the neck and a loop covered with beads at the bottom. The effect is that the bead and wirework looks like bubbles spilling out of the jug and totally covering the space below. 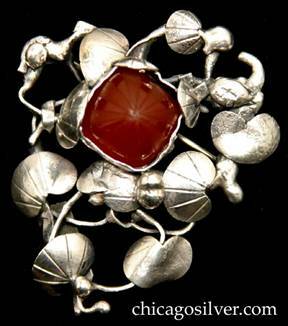 Brooch / pin, composed of freeform open wirework frame holding arrangement of chased and hammered lily pads and silver beads, surrounding a square carved square cabochon bezel-set carnelian stone. The carved lines on the stone match the chased lines on the leaves, and form segments that are alternately frosted and then polished. Stone is very dimensional and has an open back to let in light. Heavy. 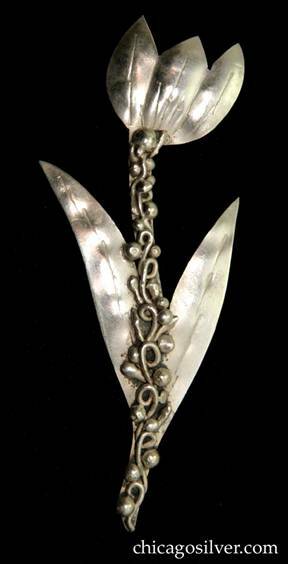 Brooch / pin, extremely large, in the shape of a chased and repousse flower with two long, thin leaves on a twisted, irregular applied stem. Hammered surfaces. 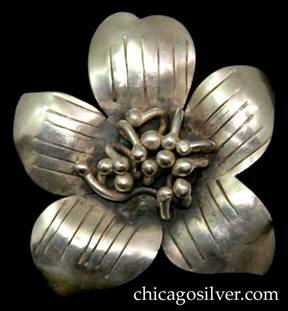 Brooch / pin, in the shape of a chased and repousse flower with three petals and two long, thin leaves on a stem with applied beads and wires down the center. Hammered surfaces. 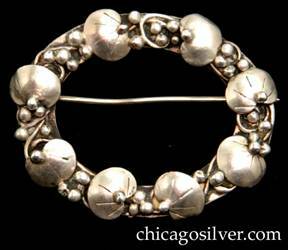 Brooch / pin, flower form, composed of a five-petal blossom with central bead atop curving stem with five leaves and numerous applied silver beads. 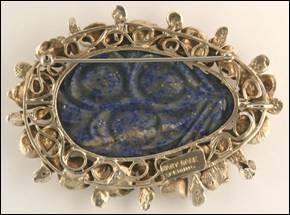 Brooch / pin, unusually large and heavy, composed of a thick oval frame of stylized silver blossoms, with four silver curving tendrils holding a massive carved oval lapis stone in the center. Stone is carved front and back. The biggest Gage pin with a stone that we've seen. Lightly gilded. 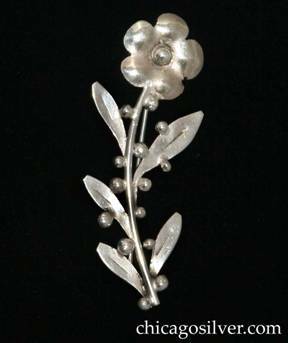 Brooch / pin, in the shape of a chased and repousse flower blossom with five petals centering a thicket of stamens with beads at their ends. Brooch / pin, large oval, composed of eight chased lily pads centering two smaller pads that flank a trapezoidal turquoise bezel-set stone with extensive black matrix. 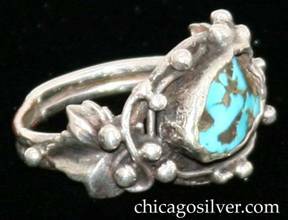 Small silver loops also hold the stone in place, and the piece is covered with applied beads and vines with underlying irregular wirework supports. 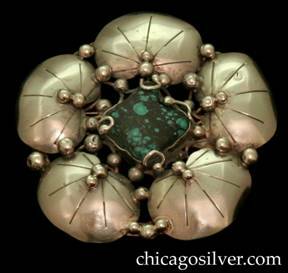 Brooch / pin, flower form, round, composed of five chased lily pads centering a square bezel-set turquoise stone with extensive black matrix, and numerous applied silver beads. 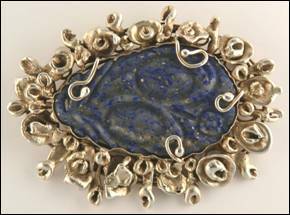 Stone is also held in place by four curving silver wire tendrils that each end in a silver bead. 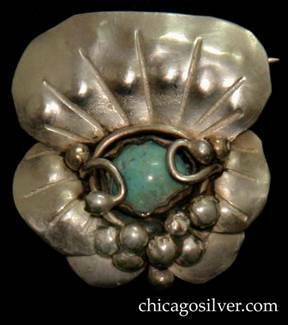 Brooch / pin, made of three stacked chased lily pads, centering a round, bezel-set turquoise stone also secured by silver loops ending in beads. Freeform pattern of beads at top also (and one bead on the back of the pin).